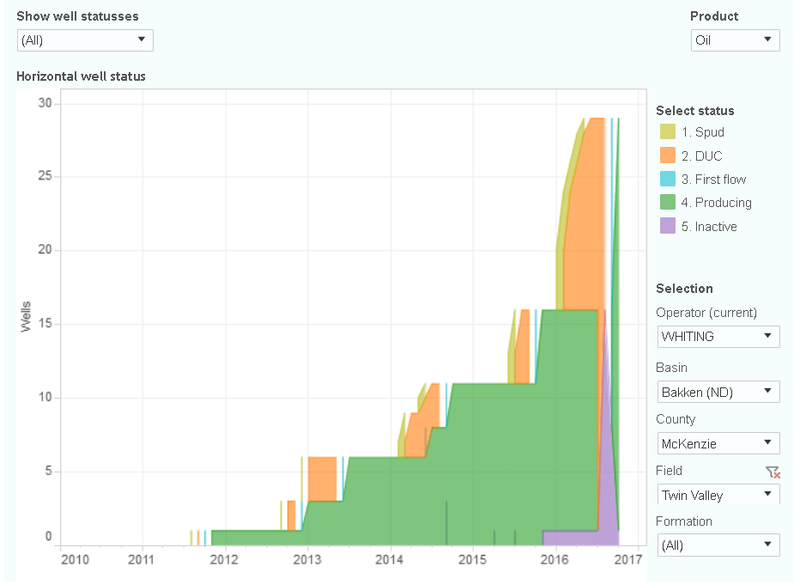 This interactive presentation contains the latest oil & gas production data from all (11998) horizontal wells in North Dakota since 2005, through October. Taking many by surprise (the EIA included), oil production in North Dakota rose in October with 70+ kbo/d from the previous month. This was the largest month-on-month increase in the history of North Dakota. This happened despite that in October 51 new horizontal wells started production, versus 73 in September. These 73 September wells however, had an excellent 2nd month; on par with the 45 wells that started in June, which caused the uptick earlier in July. Besides that, far fewer wells were shut-in: the average downtime of all wells was 3.2 days in September, vs 2.0 days in October (non-confidential wells). In the “Well quality” tab you can see in the top graph that wells starting in 2016 are peaking higher in the first couple of months. The last tab (“Top operators”) shows that Whiting and Continental Resources contributed a significant part to the production increase in October. This “Ultimate Return” overview shows the relationship between oil production rates, and cumulative oil production, for all the wells that started production in a specific month. By displaying the average well of each month in the last 12 years, too much details are shown in this graph. However, I hope it helps in getting a rough picture on how all these wells move over time towards their ultimate return, and how much this return roughly could be. If you click (or tab) on a month in the legend on the right side, the performance of the wells that started flowing in that month will be highlighted in the chart. You can see that the (small number of) early 2005 wells started with a lower initial production rate, but kept those rates for longer than later wells. The two short lines in the top left of the chart show the good performance of the June and (just left of it) the September 2016 wells. Both groups of wells reached about 700 bo/d in their best calendar month. This start is promising, but it’s too early to say how these wells will behave after the initial flush production. If you deselect (using the “Year of first flow” selection) the 2005 wells, and click “apply”, you’ll get a better view on how recent wells are behaving in the top left corner of the chart. For a more detailed description of these new overviews, please visit the first version of this advanced presentation for ND available here. [Update] I’ve looked a little closer at the data, and have shared in the forum a few more observations. You can view these if you click here. Coming Friday (Dec 16th), I’ve planned another update on all the US states that I cover. I know for a fact that a top 5 producer built 750,000 barrels of storage earlier this year. 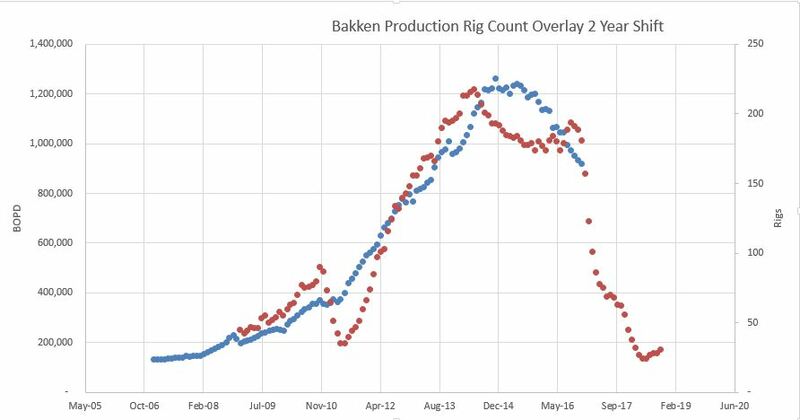 If storage was being unloaded in October, is there a way via the Confidential well status for instance, that this would show up as production in the data? Possible, but unlikely, as there isn’t a single confidential well that shows a large abnormal increase. In the “Well status” overview, if you select Continental Resources, you’ll see (especially in the bottom graph) that they greatly increased production from existing wells in Sep & Oct. So it looks as if these wells were temporarily throttled back (I don’t know the reason). 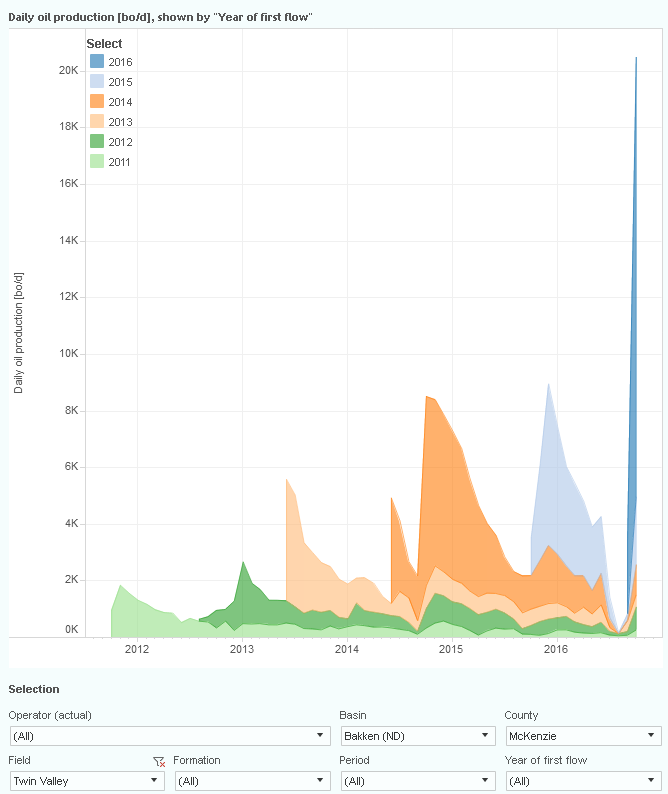 The top graph shows (status “first flow”) that Continental Resources didn’t start many new wells in recent months, and has been growing its DUC count. Good observation. Indeed production from older wells showed an increase, which is always unnatural and indicates that they were hold back for some reason (or refracc’ed, but I haven’t checked that). If you look at the front page filtered for CLR, it indicates the 2015 wells were responsible for a 10,000 BOPD increase. From like 22.6 to 32.7 MBOPD. I’ve looked a little more at the new data using the above presentations, and wanted to share a few more findings. 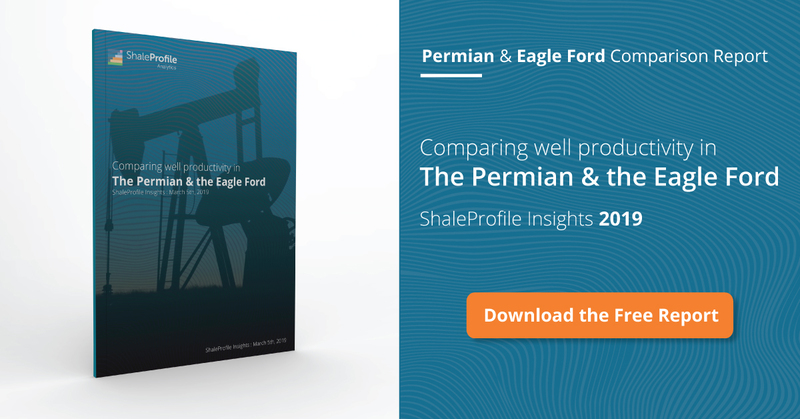 – less downtime from existing wells. As noted, all wells had 1.2 days less downtime in October (not related to the difference in calendar days). That could by itself already explain about half of the increase in production. – Whiting put several Twin Valley wells on production in Sep, while also bringing the surrounding wells (that were temporarily shut in) online. The following 3 graphs should clarify this last point. 2. that 13 DUCs were brought online in Sep.
3. that all other wells were also again put on production in these 2 months. 4. that Whiting doesn’t own any other DUCs in this field. The final chart below shows the impact that bringing all these Twin Valley wells online had on the production in this field. I’d take a stab at that Twin Valley graph and say existing wells were shut-in to frac offsets in September to avoid “communication” between boreholes. Then everything was brought back up in October. Would explain downtime overall as well. September must have been a busy month for fracs in good areas (high producing offsets). That is some great data mining. Your portal is an outstanding big data analytical tool. 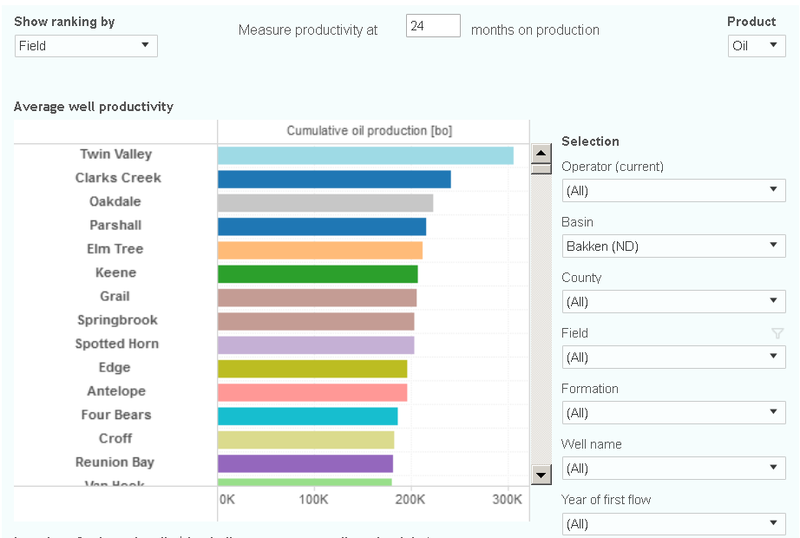 The next chart shows that well productivity in Twin Valley is the highest in all of North Dakota, if you measure cumulative oil production over all wells based on their first 2 years on production. I was looking at the EIA data versus the NDIC data. If you average the EIA for Aug, Sep, Oct you get 973. NDIC is 968. EIA graph of production forecasted though December 16 with rig count shifted 24 months into the future. It is interesting in Dec 16 the EIA number is 918. So there saying 45-50 kbopd declines for the next couple of months. Wow. Thanks for this. That means we can predict a collapse in production this January or Febuary and a price spike by March. Wouldn’t have expected it to be that quick, but there it is. OK, maybe April or May. Still, definitely by June. Not likely Nathaniel. Reason: all the TBTF WS Shalers have again serially reissued equity to be used to drill their shareholders, again! 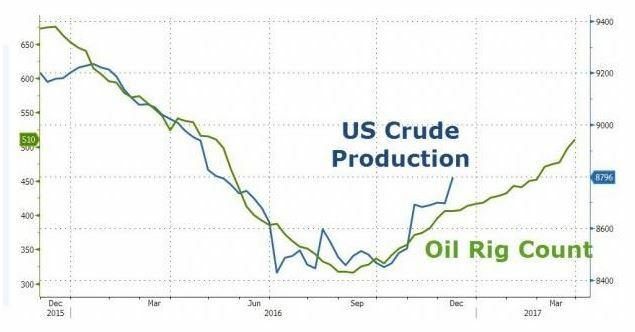 Look at the chart below with lagged Rigs and US Production. It matters not to the C-Suite if the wells are productive, so long as they keep production up to get their bonuses. And quite frankly, it matters not to the TBTF WS Banks as they will get 100% of the assets when they go Bankrupt and their lent money is very very different than yours and my saved monies. Theirs was literally printed from thin-air with a near ZERO Cost of Capital due to the magic of fractional reserve banking.